I heard the movie Zoolander No. 2 is pretty hilarious and it's a must catch when it screens on cinemas. Makes me really want to catch this movie (it started screening since 3rd March!). This movie features famous actors like Ben Stiller and Justin Theroux and John Hamburg. Most importantly? 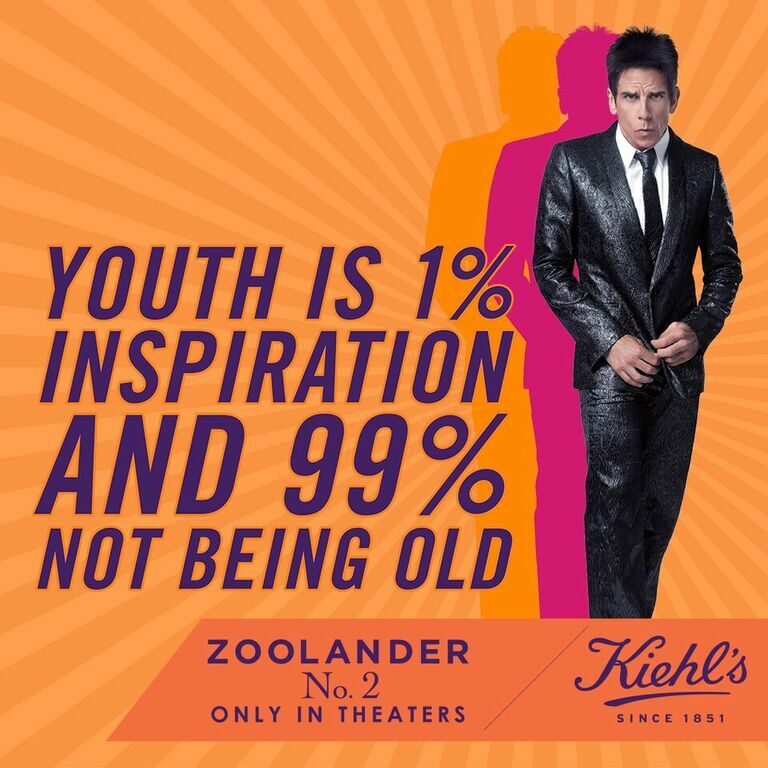 It's directed by Ben Stiller himself! 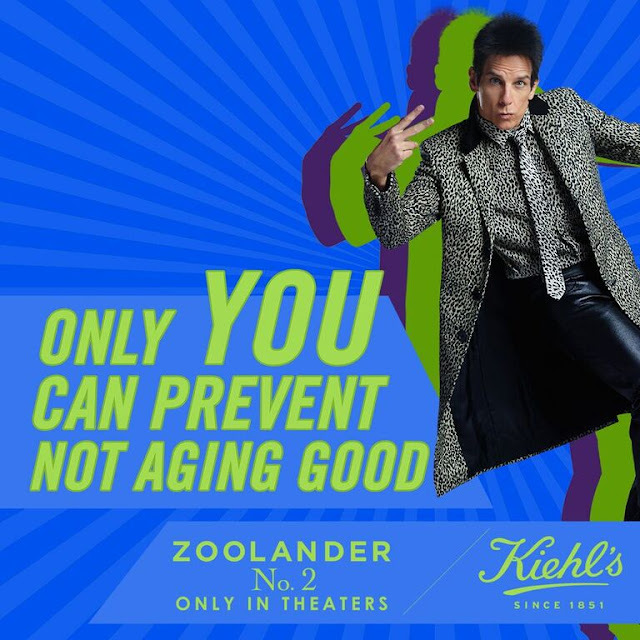 To celebrate the film’s upcoming release, Kiehl’s Singapore will introduce four Kiehl’s x Zoolander2 Ridiculously Age Good sets, each featuring a carefully curated selection of iconic Kiehl’s products. 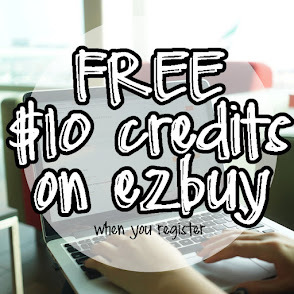 Check out the awesome possum Kiehl's products in the following sets! These Kiehl's skincare sets will be available for purchase at all Kiehl’s boutiques starting March 3, 2016. My favourite? The Clearly Corrective Brightening Set @ $90 (worth S$118) to remove my unsightly dark spots and past blemish marks! The line eraser with10.5% Vitamin C as potent as Retinol without the sensitivity, Powerful-Strength Line-Reducing Concentrate is clinically-demonstrated to improve overall skin texture, tone and radiance while reducing the appearance of lines and wrinkles. Formulated with White Birch, Peony Extracts, and the latest generation of Vitamin C, Activated C, Clearly Corrective Dark Spot Solution is a fast-acting serum that evens skin tone and diminishes dark spots to impart overall radiance and luminosity to the skin. Formulated with Caffeine, vitamins, and invigorating citrus extracts to refresh and waken skin, this face wash prepares skin for a less irritating, more comfortable shave. Helps skin resist the effects of environmental stress and gives even dull, tired-looking skin a fresher, healthier appearance. With Imperata Cylindrica Root Extract, Antarcticine, and Cucumber Fruit Extract, this non-oily, quickly absorbed hydrator visibly reduces the appearance of oil and leaves skin looking and feeling more balanced. Oil-free, paraben-free, fragrance-free, colorant-free. ABOUT KIEHL’S SINCE 1851 Kiehl's was founded as an old-world apothecary in New York's East Village neighborhood. Its unique, extensive background represents a blend of cosmetic, pharmaceutical, herbal, and medicinal knowledge developed and advanced through the generations. Today, Kiehl’s Since 1851 is in over 50 countries worldwide and remains committed Kiehl’s to serving each local community uniquely efficacious skin and hair formulations made with the finest natural ingredients in the apothecary tradition. In addition to Kiehl's freestanding stores nationwide, Kiehl's products are available at www.Kiehls.com.